The highlight for the month of January was our CEO’s business trip to Rwanda which reminded him of his homeland — Singapore. Rwanda is an extraordinary country that went through immense change and growth over the years, and she understands that development is not an end point but rather a continuous process. Furthermore, the leadership in Rwanda has won praise for stamping out corruption, restoring stability, and attracting investment to the country. Her relative success is undoubtedly due to its thought and visionary leadership; her ability to foster national unity and cultivate sense of independence amongst the people in the country. Like Singapore, Rwanda is clean and safe. In 2014, the Transparency International ranked Rwanda as the fifth cleanest out of 47 countries in Sub-Saharan Africa and 55th cleanest out of 175 in the world. The country is also increasingly perceived internationally as a safe destination. In terms of population, Rwanda has a predominantly young population and their work ethic and effectiveness is quickly making it a very investor-friendly environment whilst equally pursuing its own development agenda. According to World Economic Forum in 2017, Rwanda is one of the global leaders when it comes to gender equality and is continuously progressing towards gender equality across a range of different measures. Thus, this sets a level playing field for people in Rwanda regardless of their current development status. Quoted from Mr Benedict Oramah, president of the African Export-Import Bank, “This is a country that was all but written off some two decades ago. But just like the phoenix that died and arose from its ashes, it emerges to become the shiniest star on the continent. The shiniest in terms of governance, in terms of the can-do spirit, doing those things that nobody ever thought was possible.” Rwanda’s thought leadership have since delivered significant progress in healthcare advancement and development of the country as a whole. In much the same way as many believe that blockchain is the future, so too prevails the popular belief that Rwanda is the future. And Sentinel Chain the means to create a fairer and more equitable future. This is why we are here! Roy visited the Rwanda Ministry of Agriculture and Animal Resources to discuss about the Girinka Programme which is a national social protection scheme to transform livelihoods of the people. Under this programme, those who are in serious need of help in the region would get dairy cows from the government. To promote brotherhood, the first female calf would be gifted to his/her neighbour. The use of manure as fertilisers has led to an increase in agricultural production, increase in incomes, and a decrease in malnutrition in Rwanda. Moreover, if you follow our Twitter (@sentinelchain), our CEO and Dr Hamadoun Toure from Smart Africa, had a fruitful discussion on partnership on 20th January 2019. Smart Africa is formed to accelerate socio-economic development through ICT. The organisation is chaired by Rwanda president, Paul Kagame, and endorsed by all Heads of State of the African Union. To close the loop on Rwanda-related engagements for the month, 31st January saw meeting between Roy Lai and folks at the High Commission of the Republic of Rwanda in Singapore. Pictured here is Rwanda High Commissioner to Singapore, Guillaume Kavaruganda and Commercial Attache Lucas J Murenzi. We believe that Sentinel Chain will continue to grow and impact lives on a global scale, and we are grateful that we are known globally for our business vision for creating improved lives and livelihoods. Our illustrious advisor, Professor Pei Sai Fan, delivered keynote at the Security Token Future Global Conference in Singapore on 25th January 2018. Professor Pei provided valuable insights on tokenized securities and the future of Singapore. In his discussion about Token Security Offering (TSO) complementing and improving the inadequacy of the current financial market, he exemplified Singapore-originating Sentinel Chain as an exciting and practical blockchain project with a real world use case as described by the World Economic Forum. Moreover, he emphasized on the importance of financial inclusion and improving the lives of people while taking advantage of the current digital revolution in order to have a more integrated economy. This one-day event saw close to 200 attendees and speakers from both traditional finance and blockchain industries, and enabled participants to network, exchange knowledge, and learn in a collaborative, open discussion platform. On 28th January, Bernardo Corti, InfoCorp Latam’s regional manager, presented Sentinel Chain at the “Iniciación en cripto monedas. La evolución del dinero”, a blockchain conference sponsored by the Rosario City Government to create awareness on the impact of cryptocurrencies and blockchain technology on the world, and in all sectors and industries. Held at the government-supported Entrepreneurs Club of Rosario (Club de Emprendedores de Rosario), the co-working space provides tools to promote and encourage entrepreneurial activities with social impact for development of Rosario and the region. Despite the unfavourable weather conditions experienced in town that day, there was still a high event turn-up rate. Bernardo gave a detailed presentation about Sentinel Chain and its road map for the livestock industry in Argentina and Latin America. “It was good to be there, because it means that the government considers us a project with positive social impact, because of our goal of financial inclusion.” Bernardo Corti. Sentinel Chain is a B2B marketplace for financing services to be provided to FarmTrek networks that ultimately provide livestock-backed financing to farmers. Sentinel Chain does not provide financing services; rather it is an IT platform that facilitates the reselling of livestock-backed loans offered by financing companies (sell-side) to offshore financing companies (buy-side). Sentinel Chain is unique because it provides proof of collateral asset that is managed by the sell-side financing companies, without violating asset owners’/borrowers’ privacy. Since Sentinel Chain is a consortium blockchain that is governed by strict access to enforce KYC, whitelisted addresses as well as other mechanism to facilitate trusted yet decentralized trade operations, the only way that public can access Sentinel Chain is via loan portals or loan aggregators that facilitates SENC transactions. We are in partnership discussions with some financing companies who may have existing loan portals but the key challenges are mostly with the complexity involved in integration. This is why we have embarked on the development of a new prototype for a loan portal that is integrated with Sentinel Chain called XChainLoan portal. The purpose of this prototype is to facilitate the buy-side of the operation with an easier way to integrate with Sentinel Chain. The development of this prototype has been kick-started in January. Although it is not a part of the initial Sentinel Chain roadmap, we believe it will add tremendous value to increase our ability to succeed. With change comes progress. And here we are on the brink of change of the lunar year. As we end the year of the dog, it is with gratitude to all in the team and our strong community supporting the Sentinel Chain vision, for without one and all of us, we would not have come this far this soon. 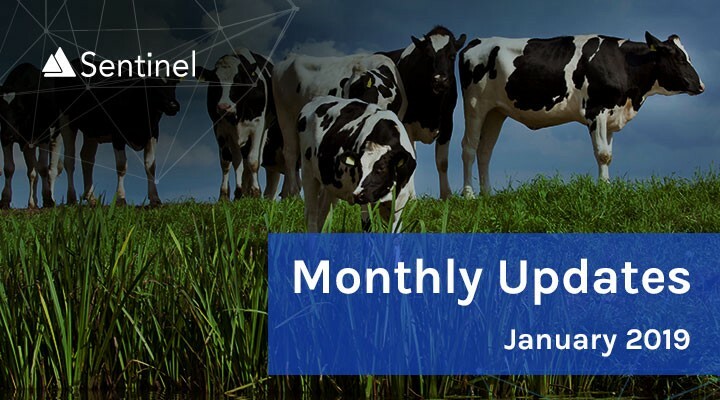 Let’s all look forward to an exciting new year of the pig and news ahead for Sentinel Chain. Happy Lunar New Year everyone!